In today’s competitive marketing world, vendors are in a constant race to be the first to offer innovative new features that can improve performance and attract more customers. The Social media has build it’s own place in business filed like Facebook is most innovative platforms in the new world of social media advertising is Facebook. Step 1. Click on the three bar menu tab in the top left. Then, hover your mouse over all tools and finally, click Page Posts. Step2. In the center-top, click the + Create Post button. A floating window will appear, labeled Create Unpublished Page Post. Step 3. This part is important. At this point, I like to scroll down and click on, Use this post for an ad. It will also be published to the Page later. Step 4. Create Your Ad – Here fill in the blanks. the call-to-action button. Just click the drop-down arrow and select which button you want to use. Be sure to scroll down, double checking the Use this post for an ad. It will also be published to the Page later. tab as you go and fill in all the blanks.Once you fill the post text as per your requirement, click the Create Post button at the bottom of the floating page.At drop down menu, you can select any of them. Step 5. 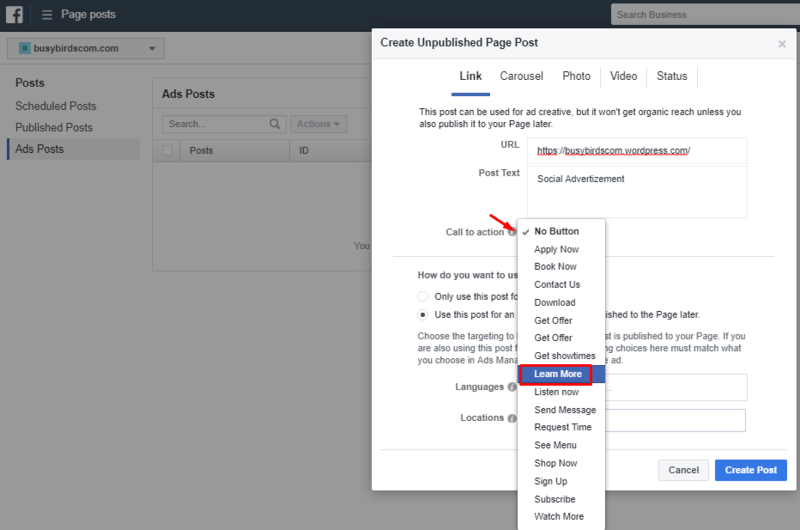 Wow, finally you have created your first Facebook post with a CTA button.On the left, select your new post by checking the box. Next, click the drop-down arrow labelled Actions. Now you have a choice to either publish the post now or schedule it for later. Step 6. 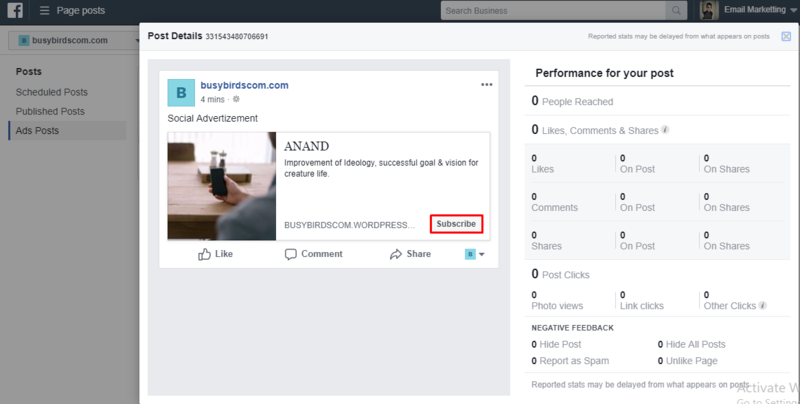 Once you will click on you page, Here’s what your post should look like on your Facebook page with its Call-to-Action button in the bottom right corner. you have mentioned at Call to action drop down that will appear on you FB page. Step 7. Now go to your EasySendy Pro account and click on “Social” at the right side of corner on dashboard. Click on Facebook Camppaigns >> View All Campaigns. Step 8. 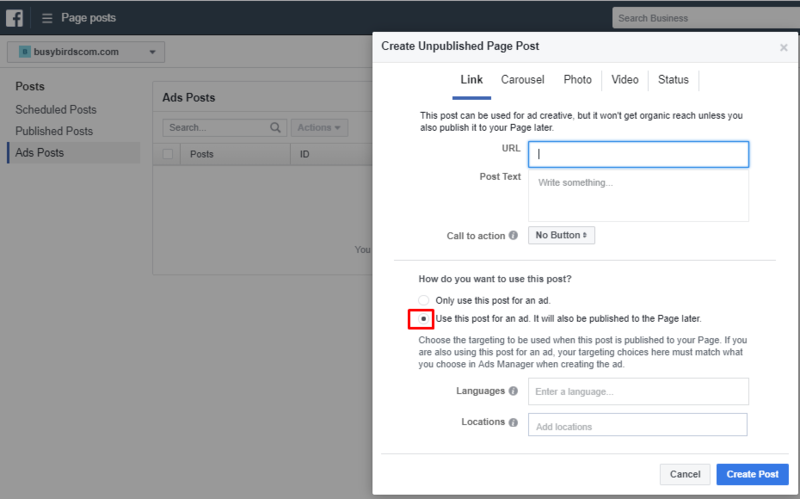 At here, Create the New CTA post Campaign and fill in all the blanks and click on Submit Post. Step 9. Once you submit the post that post will share on your Facebook page.